Enlisting the help of my dye-guru Leanne, yesterday was spent dyeing massive amounts of hemp/silk charmeuse. The fabric supplier warned it was a notoriously hard fabric to dye, so we did a fair bit of swatch testing first. 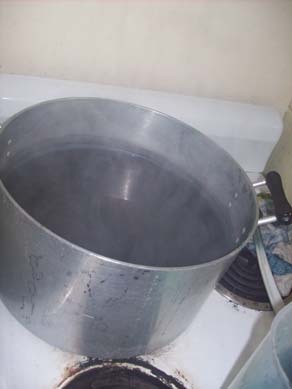 Above is a shot of one of the steaming dye baths. 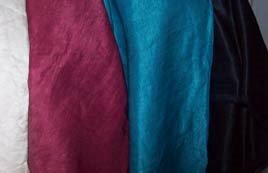 The final fabrics, with the original natural colour on the left. I am not 100% happy with the colours, but I think we (read: Leanne) did exceptionally well in light of all the variables in the process. 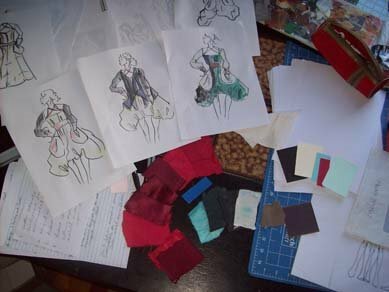 The final proportions of the colours in the design will be crucial. Swatch tests, colour chips and design roughs.